Day 6 – tired. Long slog from Siem Reap to Bathambang. We were supposed to be in Pursat tonight but didn’t make it. There was the usual dilly-dallying of breakfast, packing up and generally trying to herd 9 bikers, but I also wanted to ship a souvenir back home so I delayed the departure a bit more than usual. So there was a road from Siem Reap in the direction of Bhatambang and there was a road from Bhatambang in the direction of Siem Ream. But they didn’t connect on any of our maps. Dean had checked Google Earth and decided that there was indeed a way between the two, but it looked like it crossed a marshy area or stream bed or something. So we needed to get an early start because there was no telling whether we would make it through or have to backtrack to take the long highway around. 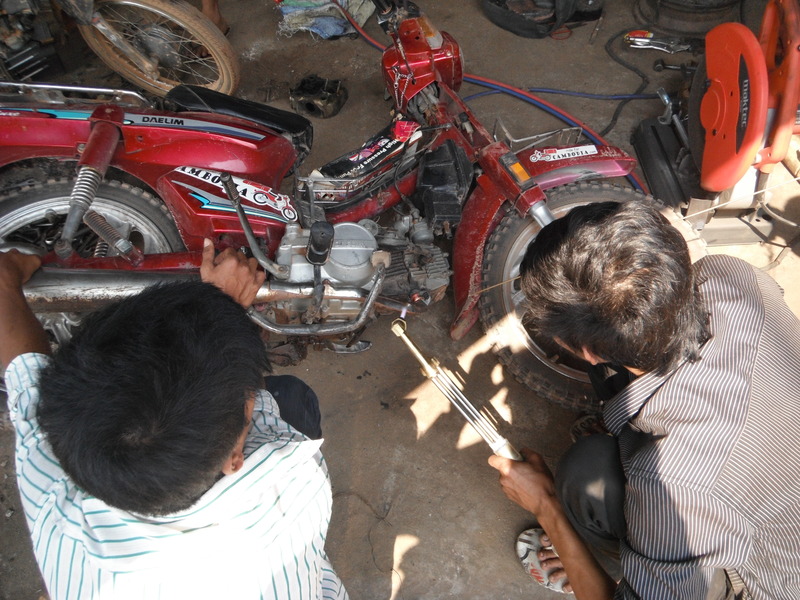 John had issues with his exhaust and bought a new one in Siem Reap. Not sure what his exhaust problem was exactly, but when they fitted the new exhaust they snapped off one of the studs in the head. So Frank and John were getting John’s fix fixed and were going to take the long highway route rather than doing the silly route with the rest of us. About 1/3 of the way down the highway to the silly route “shortcut” Laurence’s bike also had an exhaust failure. The header pipe snapped off at the flange – probably from some prior off-roading. So Sam, Dave, myself and Laurence stopped at a road side welder to get it fixed. Dean, Paul and Matt kept on humming along to the shortcut. 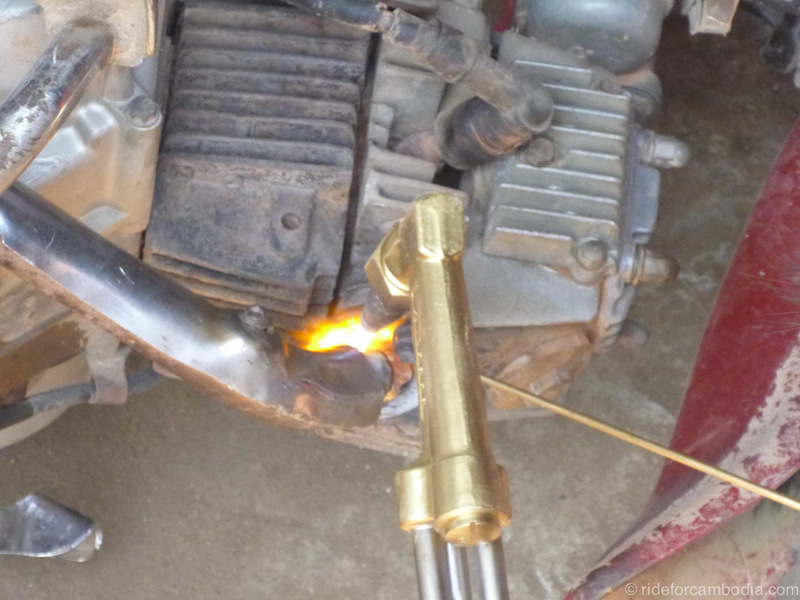 The brazing took a long time because they didn’t get it put back on at the right angle, and then it didn’t seal and blah blah blah – long story short, 2 hours in the sun waiting for what turned out to be a completely botched job. But we got tired of waiting and just went on with the exhaust partially sealed. Meanwhile Dean had a flat tire at the beginning of the shortcut route. They patched it and rode on a short distance, and it went flat again. And again. By the time they had Dean’s flat completely sorted out we had made our way to the shortcut turn off. So they waited a bit for us to catch up and we set off together down the ‘shortcut’ starting at 1:30pm. Very late but nobody wanted to be the one to say it was a bad idea. The connecting road didn’t technically exist. There were a series of tractor ruts and cattle paths. Some of the ruts were particularly deep for long stretches. The consequences for not keeping a good line were steep – if you were to veer off of the lumpy 18 inch wide strip into either of the tractor ruts you would lose your bike into it up to the handlebars. A couple guys ended up paying the price once or twice in some of the deeper sections but were not injured. We crossed some truly dodgy bridges and kept getting remoter and remoter. There was one long muddy delta type of section but as long as we kept the speed up we didn’t sink in too much and were able to make it through without incident. So I figured that was the midpoint and the road would then start improving. We thought we had it made when Dean’s GPS indicated we were about 2/3 of the way. But then the road just deteriorated into what was essentially a series of cattle tracks and we were left in dry fields bordered by swampy mush. Dean scouted for a bit but the road we wanted was about 1 km on the other side of a wide and deep area of stagnant water. Where one of the routes petered out, we happened upon a family that was living under a large tarp in the middle of a field. Literally. If I ever think I have it hard I will remember these folks. After an akward attempted conversation about direction and a successful but weird purchase of 1 liter of fuel by me, Dean had the brilliant idea to call Visa from Sustainable Cambodia to help us convey what we wanted to ask and to translate their answer back. So Visa helped us to negotiate with the family to guide us through the fields to the other side where we could pick up a road. The father (presumably) led us through the fields, across a mucky stream, onto a dirt track, then finally to a decent dirt road. We were particularly grateful and everybody each gave him a dollar. The theory was he probably wouldn’t take $7 for the guide, but that he might be winning to take $1 from each of us – it worked. We figure that might have been as much as a month’s worth of wages for his family. We might have made it across eventually by dead reckoning but it would not have been pretty. The dirt track eventually made it to a highway that was only 34kms from Bathambang. We were supposed to make it to Pursat, but it was going to be another 100+ kms and light was beginning to fade. One of the casualties of the beating of our scooters took was Rocinante’s headlight. The endo she did on day 2 didn’t do her eyeball any favors and the severe rattling she took sheared off the remaining two headlight bolts. So I was pretty keen to get somewhere for the night before I had to try to use my zip-tied headlight to light the road. So when Dean said Bathambang, I pointed Rocinante that way and rolled on the throttle. Laurence was keeping up with me and the other guys hung back and took a little time to fuel up. So, to understand the next bit – there is a jealous rivalry we have with our scooters and Honda Dreams. The Dreams are 125cc instead of 100cc and fuel injected instead of carburetted and have disc brakes instead of drums and a plush suspension instead of squishy crap. Basically they have everything that our little Daelims lack in terms of modern technology. So when a couple Cambodian kids flew past on a Dream, Laurence and I looked at each other and both thought the same thing. We cracked open the throttle the little way that was left and tucked in to chase them down. It took a really long time but we did manage to close the gap quite a bit before we passed through the next town and had to slow down. Once we entered the little town, Laurence thought it was Bathambang and he stopped at a moto shop that was selling new exhaust systems. The crap brazing job the roadside moto guys did on his exhaust flange had given way much earlier in the day and his bike was both loud and ridiculous sounding at the same time. So first chance he had to get a new exhaust he jumped on it. Meanwhile I was still tracking that Dream and it was miles before I realized he wasn’t behind me. I made it the next 20 kms to Bhatambang and talked to Frank and John who had taken the long/easy highway and already had checked into a hotel there. On the way to the hotel I ran into the rest of the guys minus Laurence. After an hour or so we began to get concerned and were texting and calling Laurence’s dead cellphone to no avail. Right around the time we were discussing backtracking in the dark to find him, he pulled up. We were relieved to see him so he didn’t get too much of a hard time for 1) getting lost and 2) not having a working cellphone. Not long after, Paul dropped the gauntlet and bet we could not be on the road to Pursat by 8am the next day. The stakes were high enough that we only had a few beers each, ate and went to bed. Much more tame than what we were planning when we were flogging our bikes to death, sweltering in the middle of a field on a cattle trail while getting our fillings rattled out. Day 7 we would leave at 8am for Pursat and meet up with the Sustainable Cambodia folks by lunch. Honda Dreams with front brake disc’s?? All the brand new ones these days come from the Thai plant – drums on the front. 03 was the last Japanese Dream with a front disk. FYI, a set of Honda dream rear shocks sets you back about $25 and will bolt on to your Daelim bikes.